This mod is a creation by many people over the course of months. The original mod author, Gaveliere, has been on hiatus for over a year. There were various permissions they gave in their time on the Chucklefish forums, and as such we were able to use their original assets to continue and build upon the base mod, fixing it and updating it as time went on. If it means the continuation of this project, any assets or assistance in building upon this mod would be greatly appreciated. If existing assets are needed or must be altered for that purpose, you have permission to do so as needed. I request that you do not re-upload the mod anywhere else, as I would like to keep the mod progress and discussion as centralized as possible. A huge thanks to Gaveliere for creating the majority of this mod, and laying the groundwork for it. Thanks to Krystedez an ColaWolf for additional characters. with bug fixing, troubleshooting and help with various files. Thanks to HYODO and ninjakaami for providing additional sprite fixes. Big thanks to ninjakaami for making a patch to make this mod compatible with Siv's Marriage Mod. Many thanks to Mocha Mokat for helping to tweak Cursors.xnb with several transparency fixes and adding new anthro sprites for the Prairie King mini-game. Thanks to Arrkhal for the flavor update to the clinic and the updated townInterior.xnb file. Thanks to Rydel for noticing and helping fix a mistake with Emily's hands during her walk cycle, as well as portrait adjustments for Penny, Haley and Emily. Much thanks to Rydel for also making a compatibility patch for ACC & Longevity! Many thanks to Fyn for Content Pack and various support. Big thanks to lxlhunter for updating ACC for 1.3! Thanks to Sabs like "labs" for his work on the Content Patcher version. Thanks to ColaWolf for additions and fixes to 1.3. Thanks to MasterXYZ for more updates to Cursors. Big thanks to BlueSkyes for his additions to 1.3 as well as updates of old files. Thanks to Yogurl for the alternate Alex portraits. Thanks goes to Lobst for help back in 1.1 in updating Shane for 1.1 and assisting with Clint's sprites, as well as Clothing Therapy sprites. 1-21-19: Updated compatibility with Longevity; thanks go to Rydel. 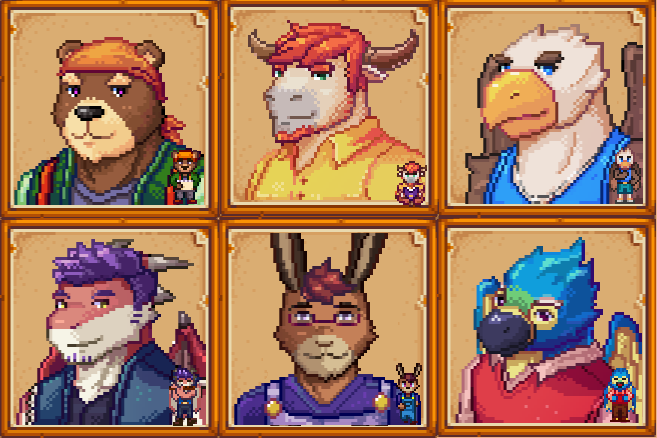 9-9-2018: Fixed an issue with Marcus's hospital portraits. Fixed an issue where Marcus introduces himself as Maru. 9-8-2018: Fixed a major issue with Hayden's walk sprite. 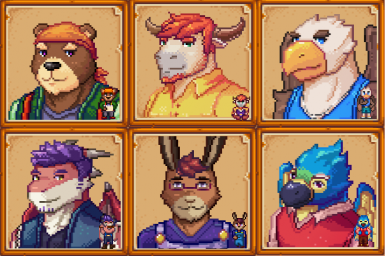 9-7-2018: Added Female to Male Marriage Genderswaps. Credit goes to Gaveliere and Blanchard. Updated the main mod with various fixes and additions. Credit goes to Gaveliere, MasterXYZ and BlueSkyes. Added an alternate Alex sprite. Credit goes to Yogurl. 6-29-2018: Fixed a major error with the 1.3 file. Added multiple smaller fixes to the 1.3 file. 6-25-2018: Replaced the 1.3 Beta with the definitive 1.3 file. Added ColaWolf's 1.3 additions and fixes. Updated the Content Patcher files. Thanks to Sabs like "labs". Moved legacy 1.2 version to Old Files. 5-10-2018: Added translation and various other fixes for 1.3 Beta. Fixed a cursors issue with Sebastian in 1.2. Credit for both goes to lxlhunter. 5-5-2018: Added support for Stardew Valley 1.3 Beta. Credit goes to lxlhunter. 5-6-2018: Added Content Patcher-friendly version. Credit goes to Fyn. Added new sprites for "Henchman". Updated the Longevity compatibility patch. Added all new sprites and portraits for Demetrius, Emily, Evelyn and Robin. Slight adjustments to Haley and Penny's portraits for better alignment. Edited several sprite errors during Emily's walk cycle. Many thanks to Rydel. Edited townInterior.xnb to change the "FLU" sign in the clinic from a human nose to a goat nose. Thanks go to Arrkhal. Updated Cursors.xnb with various transparency edits to make various sprites look better, such as water. 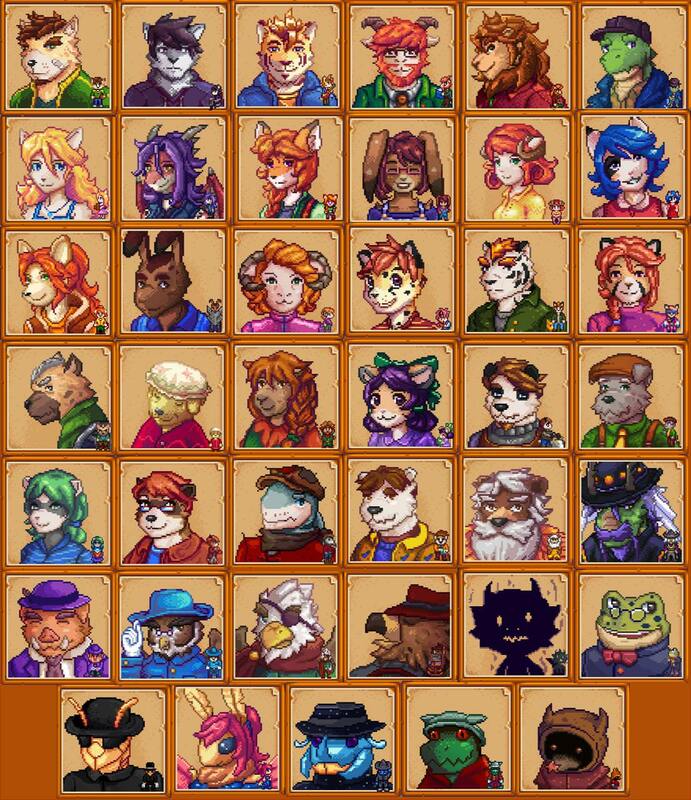 Added anthro sprites to the Prairie King mini-game. Thanks goes to Mocha Mokat. Made the mod have better compatibility with Mac and Linux systems. Added an additional file with sprites to make ACC compatibile with Si'vs Marriage Mod. Sandy.xnb updated by ninjakaami to include wings when facing left. cowPhotosWinter.xnb updated by HYODO to display proper season. Minor fixes and adjustments made to Emily's portrait. Patch added to make ACC compatible with RTGOAT's Longevity mod. 9-8-2018: Small fix for Hayden's forward walk sprite. This mod is the spiritual successor to @Gaveliere's excellent, but no longer functional, Anthro Characters mod. We now have options for marriageable female to male genderswaps for ACC! You can find the links for them below. The official Chucklefish forums thread for this mod can be found here. This mod does not affect the player-character; for that I recommend LackeDragon's Furry/Anthro Player and FurColors mods. The mod is now compatible with Siv's Marriage Mod. Download the appropriate patch file below and overwrite after installing ACC and SMM. A 1.2 legacy version is available for those who choose not to update. install via the Stardew Valley Mod Manager; install this mod manually. We now have sprites and dialogue options for the eligible female to male gender-swapped characters! Just download the genderswap file of your choice under Miscellaneous Files, extract it with a .zip file extractor such as 7zip, then follow the instructions packaged within. ﻿ONLY USE ONE OF THE INCLUDED FILES AT A TIME! If you encounter any bugs, please report them after insuring you've followed all installation instructions correctly and have no mod conflicts. A titanic, overwhelming thanks to Gaveliere for creating this mod, for creating the ACC genderswaps, and for rigorous testing. sprites for the Prairie King mini-game. patch for ACC & Longevity! If you come across any bugs, please report them after ensuring there is no mod conflict.